Luis Enrique, whose skills, leadership and charisma made him a fan favorite throughout his years at Camp Nou, got his first experience with the Spain National Team in the 1992 Summer Olympics in Barcelona where he helped the team to the gold medal, four years before he would leave Real Madrid to sign with Barça. But while that moment was an unforgettable one for Luis Enrique, two years later, at the 1994 World Cup in the United States, he would become the victim of one of the most blatant cases of on-the-field aggression in football history. It was the first of what would become three World Cups for the Spanish midfielder, and he had helped Spain qualify for the quarterfinals after making two appearances in the group stage and then scoring a goal in the last 16. Spain was set to face Italy for a ticket to the semifinals. It was a match Luis Enrique would never forget. With Italy clinging to a 1–0 lead after a Roberto Baggio goal in the 88th minute, Spain came charging forward to try and tie the game and send it to overtime. In the 93rd minute, on the final attack of the game, Luis Enrique was in the Italy penalty area, preparing to receive a cross and fire a shot on goal. But Italy’s Mauro Tassotti, defending, elbowed Luis Enrique in the face, breaking his nose on the play and leaving him lying on the ground, gushing blood all over the grass. But the referee made no call. No penalty kick. No red card for Tassotti. No chance for Spain to tie the game and send the game to overtime, where it would have a one-man advantage. While Italy won, FIFA would end up suspending Tassotti for eight games. Tassotti would never play for again for Italy, which would go on to make the final that year before losing to Brazil. Two years later, Luis Enrique left Madrid to sign with Barça, and quickly won over the blaugrana faithful, eventually becoming one of the team’s captains. 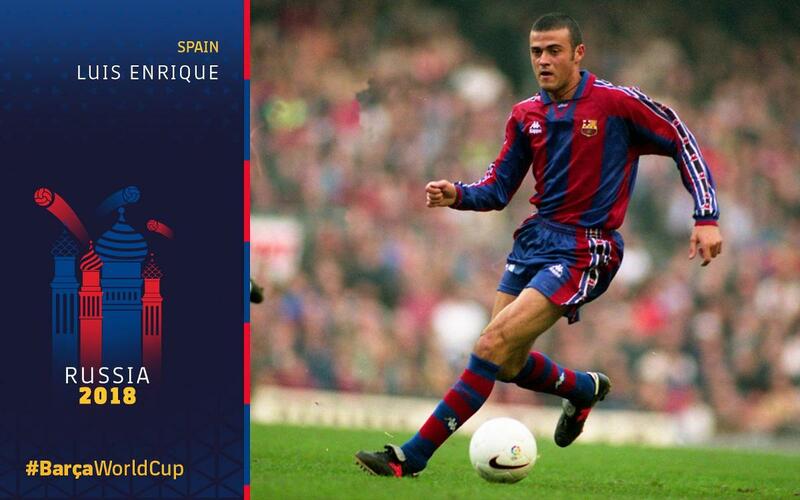 Luis Enrique would go on to make 354 appearances for Barça and would score 123 goals. He later retired in 2004. Then, in 2008, he came back to Barça — as the Barça B coach. He stayed three years at the helm of the reserve team, before stints at AS Roma and Celta. Finally, in 2014, Luis Enrique made one more return to Barça, this time as the first team manager. In his very first season as the team’s top coach, Barça won the treble, forever cementing the legacy of one of the Club’s most recognizable personalities.